Before he joined Trump, Bannon bragged he made Breitbart the home of the "alt-right." Now he's back. Home > Before he joined Trump, Bannon bragged he made Breitbart the home of the "alt-right." Now he's back. Stephen Bannon, former White House chief strategist and restored executive chairman of Breitbart.com, orchestrated and supported many of the worst elements of the campaign and presidency of Donald Trump. 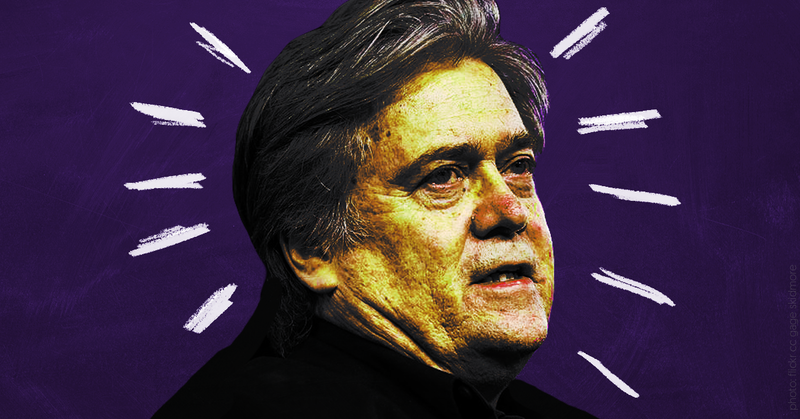 Before, during, and after his direct involvement with Trump’s political ambitions, Bannon used his experience -- and his extensive and complicated financial connections to the far-right billionaire Mercer family -- to stoke the flames of nativist anger, encourage Trump’s most racist and misogynistic rhetoric, support far-right political candidates across the globe, and attack all perceived enemies of Trumpism, potentially including Trump himself. Stephen K. Bannon has always been more comfortable when he was trying to tear down institutions — not work inside them. With his return to Breitbart News, Mr. Bannon will be free to lead the kind of ferocious assault on the political establishment that he relishes, even if sometimes that means turning his wrath on the White House itself. Hours after his ouster from the West Wing, he was named to his former position of executive chairman at the hard-charging right-wing website and led its evening editorial meeting. And Mr. Bannon appeared eager to move onto his next fight.